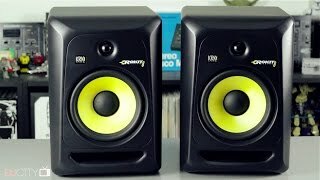 KRK Rokit studio monitors have long been regarded as the best value speaker for both amateur and professional audio engineers alike. The signature yellow Kevlar woofer is one of the most recognizable in the industry. With unit sizes ranging from a 2-way, 4" driver all the way to a 3'way, 10" driver, there is something in the line for everyone. Generation 3 has been every bit as successful as the previous models and have cement KRK's place in studios around the world. 2016 saw the launch of the V Series 4 product line from KRK. 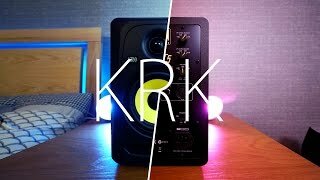 Taking their award winning Rokit series to the next level, KRK sought to offer an even more durable, more powerful and more detailed product for the more serious professionals. Boasting a Kevlar woofer AND tweeter, more than double the wattage and the most accurate reproduction of any product they've produced to date, KRK V Series have landed on the desks of some of the world's top producers. 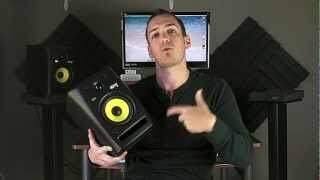 KRK also produces a full line of subwoofers and headphones to round out their studio monitor offerings. The subwoofers range from a compact and punchy 8" right up to a powerful, high output 12"; perfect for all sized control rooms and other larger scale installations. The KNS headphone series are a faithful reproduction of the studio monitor line, making the swap from open air listening to private monitoring a breeze. As the world’s top selling studio monitor line, you are sure to find KRK in a studio near you.